Official Secrets: As festivals often tend to do, when you see enough movies, eventually certain topics or themes emerge. This year, with the release of both this film and The Report, (not to mention last year’s Vice) it’s clear that for filmmakers, it’s finally open the Bush/Cheney era. Where The Report took them to task for their illegal policy of “Enhanced Interrogation Techniques,” this film shows the effect of their trumped up fake-WMD war against Iraq with the U.S. number one ally, England. Katherine Gun (Keira Knightley) is a low-level staffer at Britain intelligence. When she comes across an extraordinary memo from the NSA, asking her division to spy on UN member nations whose vote towards the war appears negative. With this intel, the thought was that the U.S. and G.B. could essentially blackmail those countries into voting for the war. Disturbed by what she sees, Katharine copies the memo and leaks it to an anti-war activist, who in turn takes it to the Guardian, where journalist Martin Bright (Matt Smith) runs with the story. The film portrays Katharine as a justified moral objector, much in the manner of Edward Snowden, in seeing their country perform a knowingly illegal act, and acting out of their conscience. Undeterred by the UN’s negative vote, of course, Bush/Cheney/Blair’s war went on anyway, causing thousands of deaths to little appreciable value, but Katharine, unlike Snowden (at this point), was ultimately viewed as an uncompromising and brave woman, putting her life and career at risk to hold her own government accountable. Slickly shot by director Gavin Hood, the film moves at a brisk, but believable pace. 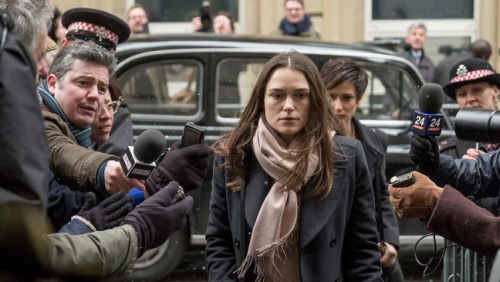 Less dry and procedural than The Report, it pays a bit more attention to dramatic tension — after charges are brought against her, Katharine enlists the aid of a legal team lead by Ben Emmerson (Ralph Fiennes) — without sacrificing any of its gravitas. It doesn’t do the war dead any good now, but for the rest of us, it at least it puts the travesty on full display. Clemency: By the time the film opens, Bernadine (Alfre Woodard) has been a prison warden in a death penalty state for many years. In that time, she’s put a dozen men to death, a burden she used to be able to reconcile, but it’s clearly taking a serious toll on her soul. She can’t sleep; she drinks too much; she can’t bring herself to reconnect with her doting husband (Wendell Pierce). In her weariness, she is not alone: the prison chaplain (Michael O’Neill) is also coming to the end of the line, as is Marty (Richard Schiff), the lawyer for a convicted cop killer Anthony Woods (Aldis Hodge), a seemingly docile man stuck on death row for 15 years as the appeals process grinds along. They are all exhausted physically and morally, having to endure the misery of the capital punishment system. Forget moralizing, at least alone, the film suggests: The system is rotten in all sorts of ways. When Bernadine finds herself questioning the outcome of Woods’ ordeal, it becomes more and more difficult for her to maintain her dispassionate facade. Chinonye Chukwu‘s film is appropriately heavy, given the nature of the material, but it’s also sludgy, both cinematographically speaking, where scenes are dim and too dark, and in script, with many conversations too thick for their purpose, and a propensity for expository dialogue (and worse news broadcasts). Woodard is commendable, and there are times when Chukwu‘s slow-rhythm style works very well (a scene where Woods waits in vain for his family to visit is a necessary elongation), but too often the material just feels stretched. It’s far from a polemic, in fact, Chukwu commendably avoids making hard and fast moral point, other than to say the death penalty claims a lot more than one convict’s life, but it’s still a little too murky to connect the way it longs to. Wounds: Because of my undying love for Under the Shadows, let me first talk about Babak Anvari’s new film in positive terms. Set in New Orleans, the Iranian Anvari, whose debut feature was shot in and around Tehran and Jordan, spends a commendable amount of energy letting his film soak in the vibe of its locale. There’s nothing flashy, or touristy, about his appraisal of the city – it feels decidedly lived in, from the bar where budding alcoholic Will (Armie Hammer) works, to the small-house apartment he shares with his live-in girlfriend, Carrie (Dakota Johnson). It’s not an easy city to capture, beyond the obvious, and Anvari does it admirably. The opening scene is also a knock-out, with a rising tension between patrons at the rundown bar where Will works: Alicia (Zazie Beetz), a woman Will has a serious thing for, strolls in with a new boyfriend, Jeffrey (Karl Glusman); a wild-eyed, active-duty vet (Brad William Henke) comes down from his upstairs apartment and starts throwing ‘em down; while a small group of young, pasty-looking college students come and sit at a dank table to drink generic beers. When Eric’s equally crazed crew come in to shoot pool, it’s not long before things get out of hand and suddenly a melee ensues. It’s expertly shot, and strongly written, the kind of scene that portends to an equally fascinating narrative. Alas, that is not quite to be, however: When the fight breaks out, the college students flee, one of them leaving their cell phone behind. Will finds it, brings it home, and figures out how to open it in order to return it, but comes across a series of disturbing photos, and, eventually, a phone call with what sounds like a pack of demons on the other side. From that point, he changes, turns dark and inward, hallucinates freely, and becomes more and more unglued. Stalking around the darkness of the city, drinking indiscriminately, he splinters his life as he gets closer to total immersion. Anvari populates the film with all sorts of horror props – including a inspired use of cockroaches – but despite the quality filmmaking, and the efforts of a strong cast, he can’t sufficiently raise the stakes enough from the premise to make a truly satisfying horror film. It’s not a disaster by any means, and there’s certainly enough promise here to look forward to his next film, but this one isn’t quite there. Into the frigid climes and rarefied thin air of the spectacular Utah Mountains, I’ve arrived in order to document some of the sense and senselessness of the 2019 Sundance Film Festival. Over the next week, armed with little more than a heavy parka and a bevy of blank reporter’s notebooks, I’ll endeavor to watch as many movies as I can and report my findings.